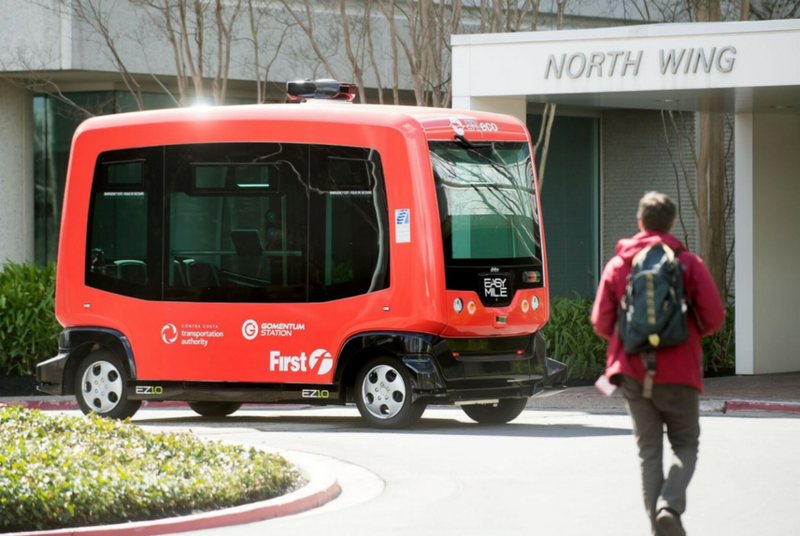 A federal agency has granted California’s Contra Costa Transportation Authority (CCTA) permission to start the final stage of testing for an autonomous shuttle pilot program on public roads. Created by a French company called EasyMile, the electric, low-speed, driverless shuttles — which don’t have a steering wheel, brake pedal, accelerator or operator — will share the roads with pedestrians, cyclists and other vehicles, according to a press release. Testing is slated to start next year, and it’s worth noting that, during this phase, the general public will not be allowed on the shuttles. Instead, only testers and evaluators from various employers within Bishop Ranch will have access. Ultimately though, the shuttles are meant to get passengers from a transit station to their final destination, so navigating a business park like Bishop Ranch is a good exercise, CCTA officials tell govtech.com. CCTA is said to be the first in the country to devise and implement an autonomous vehicle and transit pilot program, so this marks an exciting step forward. In related news, California’s Department of Motor Vehicles says completely autonomous vehicles, those without backup drivers, could be on the state’s public roads as early as summer 2018, according to The Mercury News. General Motors has acquired Strobe, a California-based startup that develops laser-based sensors called LIDARS. According to the New York Times, LIDARS create high-definition images for vehicles operated by computers. Strobe will now team up with GM’s Cruise Automation to continue making major strides in autonomous driving. In a blog post, Cruise’s CEO, Kyle Vogt, wrote about the impacts of the Strobe purchase. He noted that LIDARS have been a big bottleneck in the process of developing autonomous vehicles. Having Strobe onboard will significantly improve the capabilities of the company’s autonomous vehicles, Vogt writes, especially when it comes to cost and expanding autonomous ride-sharing services. One of the biggest manufacturers of computer graphics cards, NVIDIA, says it’s created a new, powerful computing platform for driverless vehicles. Dubbed “Pegasus,” the system can power Level 5, fully driverless automobiles “without steering wheels, pedals or mirrors, and interiors that feel like a living room or office,” NVIDIA says. Capable of delivering more than 320 trillion operations per second, the new system’s Level 5 autonomy status is a pretty incredible feat. As The Verge notes, even with all the driver-assisted technology in cars today, no commercially available vehicle currently on the road ranks higher than a Level 2. Nvdia, which is a current Jama Software customer, says Pegasus will be available to NVIDIA automotive partners in the second half of 2018. As Intel noted earlier this year, the future of self-driving transportation could result in a $7 trillion annual revenue stream. Among all the complex challenges companies producing autonomous vehicles need to overcome before then, though, has nothing to do software or hardware. Right now, the notion of stepping into a car without a driver, and entrusting it to navigate you somewhere — anywhere — safely sounds like a gamble. So, building public trust in autonomous vehicles is crucial. That’s one of the reasons why Intel is turning to the best basketball player on the planet, LeBron James, to help generate confidence in driverless vehicles via an advertising campaign, according to Business Insider. Check out the first Intel ad with James below.